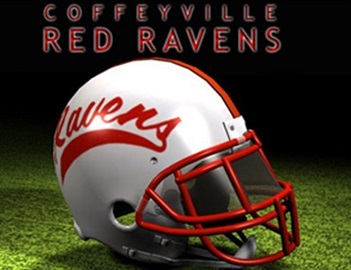 The Coffeyville Community College Red Ravens still riding high off of their week 9 win against rival Independence 21 to 16. A game which they responded well to adversity and came back in the fourth to win for their 80th time in the storied rivalry. This Saturday they will need that to carry over, as the Red Ravens may be their toughest test yet on the year. Undefeated Garden City Community College travels across the state to play Coffeyville this Saturday Night. A Bronc Buster team that were the 2016 National Champs, has not lost a regular season game since last October, truly proves to be a tough test for the Red Ravens. Garden City comes in as one of the more dominant offensive teams throughout the nation, large in part to their run game. G.C.C.C. averaging over 300 rushing yards per game, with a pair of very talented pair of running backs. Sometimes putting 8 players on the offensive line is a big reason Coffeyville Head Coach Aaron Flores mentioned they will try and match that with added lineman on the defensive side. Talking with coach Flores he says his defensive backs have the size and strength to make tough open field tackles so it will be tough to bring them off the field, but coach Flo mentioned they will need to stack the line more. Offensively the Red Ravens need to match time of possession, win the field position battle, and consistently pick up first downs. 3 things that will keep the Garden City’s offense off the field and not able to gain momentum. Head Coach Aaron Flores also said in practice these past few week they have stressed avoiding giving up the big plays or big penalties. Something that has really hurt the Red Ravens all season long is those penalty numbers. If they can keep those down, not turn the ball over and keep Garden City off the field consistently, they have a chance of pulling off the upset at home. We will carry the game on your home for Red Raven Football 98.1 KUSN with a pregame at 6:30PM. Sam Speck and Matt Jordan are on the call from Veterans Memorial Stadium Saturday night in Coffeyville with kickoff at 7PM.